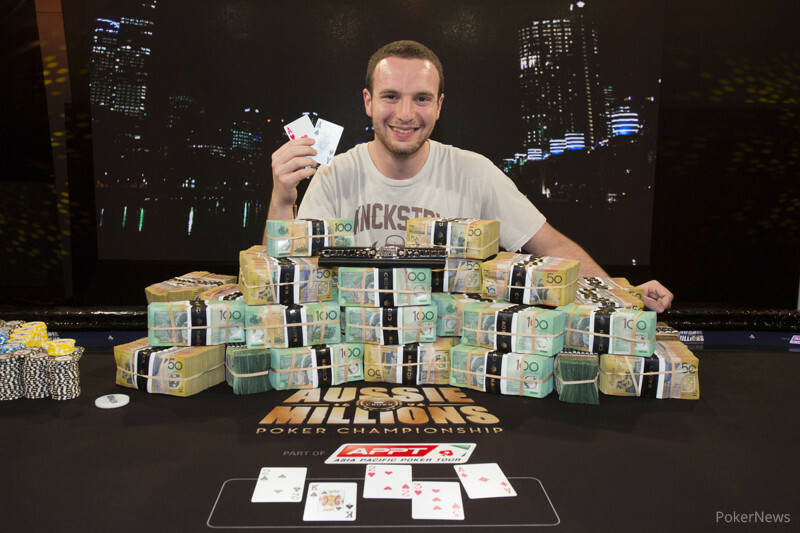 The 2014 Aussie Millions has been full of big stories. First there was the five-way chop in the $25,000 Challenge that ultimately saw Max Altergott emerge victorious, and then Yevgeniy Timoshenko overcame a huge chip disadvantage to win the $100,000 challenge. On Sunday, the final seven players of the 668-player Main Event returned to play down to a winner, and after nearly 12 hours, the man who emerged victorious to capture the AU$1.6-million first-place prize was Ami Barer. The players were deep when play resumed, so it was no surprised that it took three hours for the first elimination to occur. It happened in Level 28 (40,000/80,000/10,000) when Darren Rabinowitz opened for 160,000 and was met by three-bet all in of just over a million by Seiver from the button. Both blinds folded, Rabinowitz called, and it was off to the races. According to the PokerNews Odds Calculator, Seiver was a 55.24% favorite while Rabinowitz would win 44.40% of the time. Unfortunately for Seiver, this was one of those time as the flop came down to pair Rabinowitz's ace and make him an 86.36% favorite. The turn was a good card for Seiver as it gave him a 25% chance of hitting his flush, but it was not meant to be as the blanked on the river. 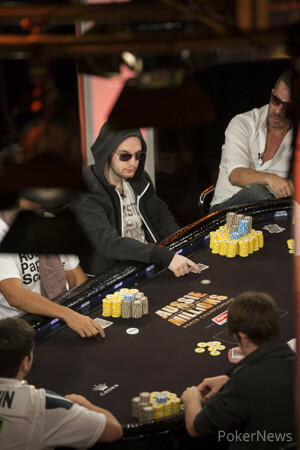 Seiver was eliminated in seventh place for AU$170,000. 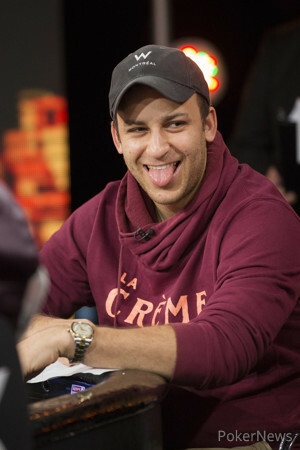 After the last Australian in the field, Andrew Phaedonos, ran into Sorel Mizzi's kings and fell in sixth place — thus ensuring an Aussie Millions champ from North America for the first time ever — Vincent Rubianes followed him out the door in fifth after running smack dab into the pocket rockets of Rabinowitz. Despite scoring that knockout, Rabinowitz was the next to go. It happened in Level 30 (60,000/120,000/10,000) when Rabinowitz opened for 240,000 under the gun and Barer responded by three-betting from the button. The blinds both folded, Rabinowitz moved all in, and Barer snap-called. Rabinowitz's rail, which included Joe Kuether, Ryan Riess, and Bryan Campanello, were on their feet and calling for a five. The flop didn't do it, but it opened up some runner-runner possibilities. "Any two across is good," Campanello bellowed. Indeed it would have been, but it was the three-across that opened up the gutshot straight draw possibility. Unfortunately for Rabinowitz and his supporters, the blanked on the river to send him home in fourth place for AU$450,000. Minutes later 2012 World Series of Poker third-place finisher Jake Balsiger was eliminated from the tournament via a bad beat. It happened when Balsiger min-raised to 240,000 on the button, Barer three-bet to what looked like 575,000 from the small blind, and the American four-bet to 1.175 million. Barer five-bet ripped, moving all in for effectively five million or so, and Balsiger snap-called. Balsiger was in great shape to double up and take the chip lead, but his odds of winning the hand dipped when the dealer fanned , giving Barer eight extra outs to make a straight. "Always a sweat!" someone yelled from the rail. The turn was the , bringing a third club, and it reduced Barer's outs to eight because Balsiger held the only club. The completed the board, giving both players a straight, but Barer's ten gave him the winning hand and eliminated Balsiger in third place. With that massive hand, Barer began heads-up play with a three-to-one chip lead against Mizzi, and it didn’t take too long for him to seal the deal. It happened when Mizzi shoved into Barer's aces, and the rest as they say is history. Our coverage from the 2014 Aussie Millions isn’t done yet. On Monday the finale of the $250,000 Challenge will play out, and of course the PokerNews Live Reporting Team will be on hand to capture all the action. A full recap of that day's action is on its way, so please stay tuned for that as well as some photos. Ami Barer opened with a raise from the button and Sorel Mizzi announced that he was all in. Barer snap-called and Mizzi, who is the only player to make the final table of the Aussie Millions Main Event twice, discovered the bad news. Mizzi had run smack dab into Barer's pocket rockets, but that didn't stop his supporters — which included Liv Boeree and Antonio Esfandiari — from calling for diamonds. "Shine bright like a diamond," they began to chant, though they were silenced when the flop came down . Mizzi was left in needed of either running queens or eights, but the turn took away any chance of that happening. The inconsequential was put out on the river to give Barer a full house, and Mizzi has to settle for runner-up and a AU$1,000,000 consolation prize. Sorel Mizzi raised to 320,000, Ami Barer moved all in, and Mizzi folded. Barer limped in, Mizzi checked, and the flop fell . Mizzi check-folded to a bet of 180,000. Mizzi limped in, Barer called, and the flop was . Barer check-called a bet of 180,000, then led out after the turn brought the . Mizzi folded. Barer limped in, Mizzi raised, and Barer folded. Mizzi raised on the button, and Barer folded. Sorel Mizzi opened for 320,000, Ami Barer called, and the flop came down . Barer checked, Mizzi bet 240,000, and Barer woke up with a check-raise to 505,000. Mizzi folded and Barer took down the pot. Sorel Mizzi raised to 320,000 with the button, Ami Barer three-bet to 675,000, and Mizzi called. The dealer spread , Barer led out for 420,000, Mizzi called, and the turn was the . Barer led out again - this time for 890,000 - and Mizzi folded. Sorel Mizzi opened for 240,000 and Ami Barer made the call to bring about a flop of . Barer checked, Mizzi bet 240,000, and Barer called. Barer check-called another bet, this time 510,000, on the turn, and then checked for a third time on the river. Mizzi put together a bet of 905,000, and it did the trick as Barer released his hand. Sorel Mizzi had the button and raised to 240,000. Ami Barer defended, the flop fell , and Barer checked. Mizzi fired out another 240,000, Barer check-raised to 525,000, and Mizzi called. Bared led out for 630,000 after the turn produced the , Mizzi called, and the completed the board. Barer checked, Mizzi quickly checked behind, and Barer instantly showed for trip sevens.